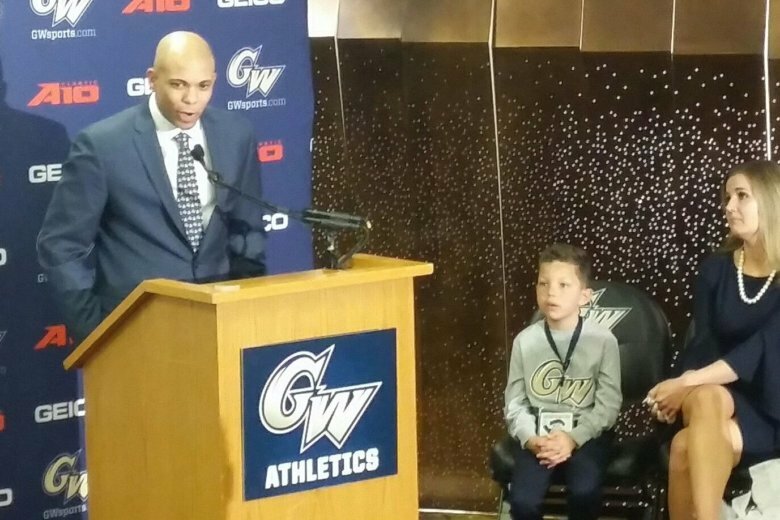 George Washington University introduced Jamion Christian, who grew up wanting to play for GW, as its new head basketball coach Monday afternoon in Foggy Bottom. George Washington University introduced Jamion Christian as its new head basketball coach Monday afternoon in Foggy Bottom. Christian replaces Maurice Joseph, who was fired after GW went 9-24 this past season. In 2018, Christian led Siena to a 17-16 record and a second-place finish in the MAAC in his lone season at the helm after being picked to finish last in the preseason coaches poll. Christian, who grew up wanting to play at GW, says he is thrilled for the opportunity to lead the Colonials. “I’m fired up to be your coach!” he said, drawing a loud round of applause from the band, cheerleaders, alum and staffers well as many friend and family there to support him. The 34-year-old Quinton, Va. native was also the head coach at his alma mater, Mount St. Mary’s, from 2012-2018. While there, he helped guide the Mountaineers to the NCAA Tournament in 2014 — their first appearance since 2008 — and again in 2017. Christian’s task now is to help guide a Colonials program back to the NCAA Tourney, where they haven’t been since 2014. Christian also coached under former VCU coach Shaka Smart in Richmond and already has family in the D.C. area. His younger brother Jarell is the head coach of the Washington Wizards’ G League team, the Capital City Go-Go.